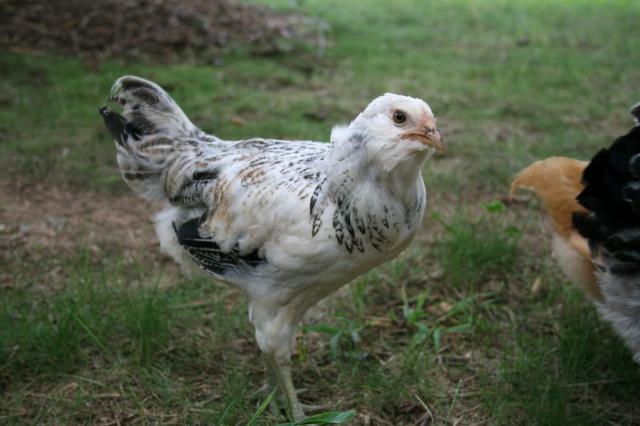 After briefly talking over an interest in "someday" having chickens, our friend gifted us with two bantams the next day. Needless, to say we were surprised, and unprepared, and overwhelmed! However, they were adorable and we were smitten. 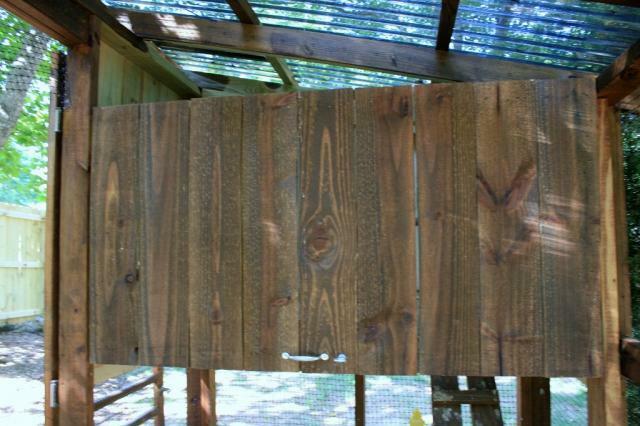 Having just finished our new fence in the backyard, my sweet husband continued the backyard project and got started on the coop and a rabbit hutch (the friend also brought a bunny for my daughter!) 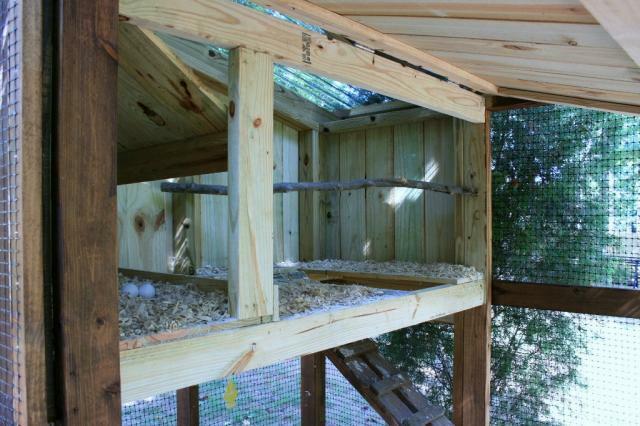 The coop took about two weeks to finish and during that time the bantams slept in a cedar tree! They were very unsettled and (I could tell) unhappy! They especially didn't like getting chased by our Westie. When the coop was finished we "had" to go get some more to keep our bantams company, of course. 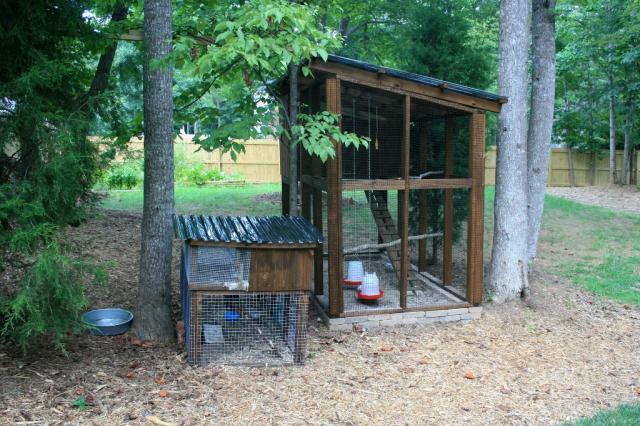 We found a man on Craigslist and had so much fun picking out our new chickens! The "chicken man" had a wide variety of birds of all ages, everywhere! It was quite the experiance catching them, one my 6 year old son was definitely up for! We let our two kids pick their own. My son picked out a sweet little Barred Rock and of course, my daughter just had to have a little Rhode Island Red chick. 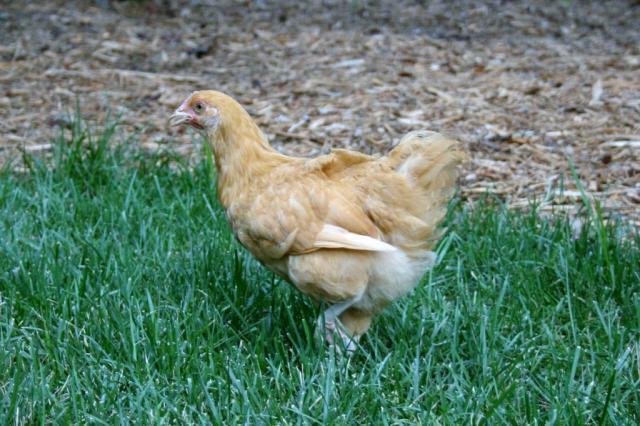 I picked out a Buff Orpington and my husband picked out a Light Brahma. Lastly, we got an EE in hopes of a colorful egg! All the chickens we selected were young, I'm not sure of their exact ages but they were not near laying age yet. We brought them home and they settled in nicely. Taking care of the little chick has been quite the ordeal! The "chicken man" had the little chicks running with all the other chickens and assured us it would do fine with ours. Well, it has, but for the first few weeks I was so nervous! It looked so tiny out there! The chick has done wonderfully, though, and is so plucky! I haven't seen any aggression toward it, in fact, it's usually the first in line for treats! 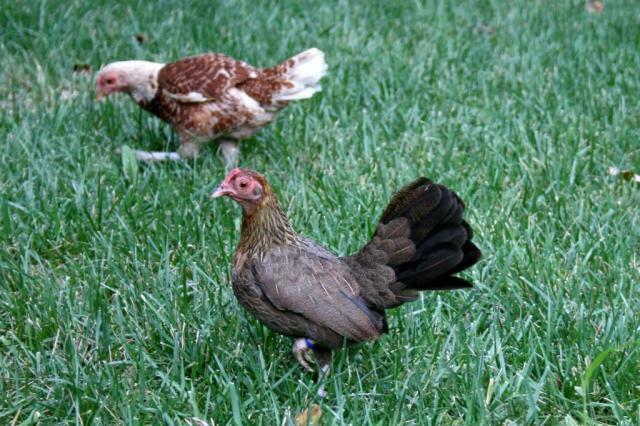 We introduced the bantams after a couple of days and they settled in as well, now looking much happier. They even started acting like chickens instead of terrified birds in a tree! It's been almost two months now and I've completely become a chicken addict! I love BYC and have learned so much! I still have so much to learn and am so thankful my sweet chickens have survived while I've scrambled to learn all about them. Let me introduce my chickens! I'm hoping they are all hens but am unsure about a couple. The EE is keeping me guessing. 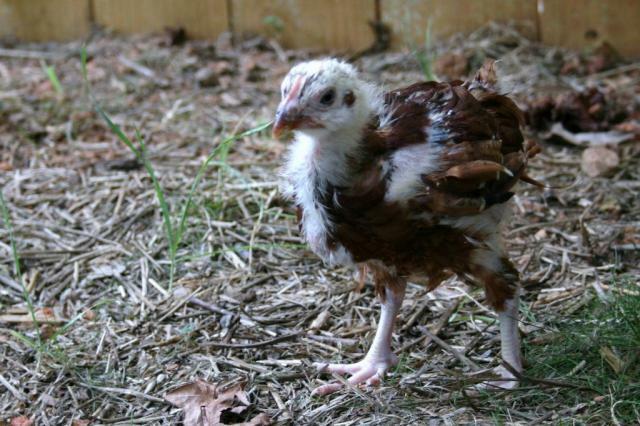 Also, the little RIR chick I'm unsure of based on it's sheer pluckiness and developing comb. I guess we'll see! 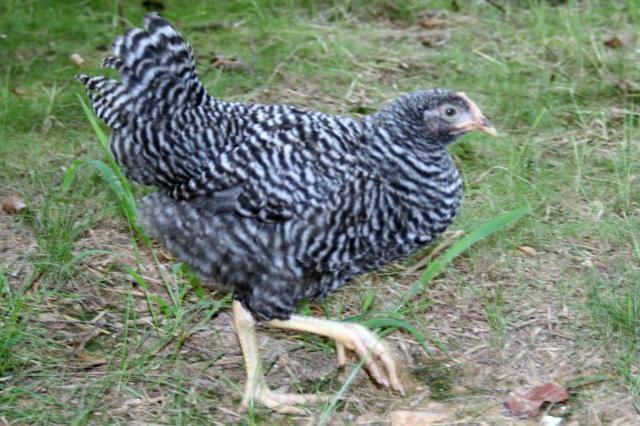 Speck, my son's Barred Rock. The EE, Stormy. 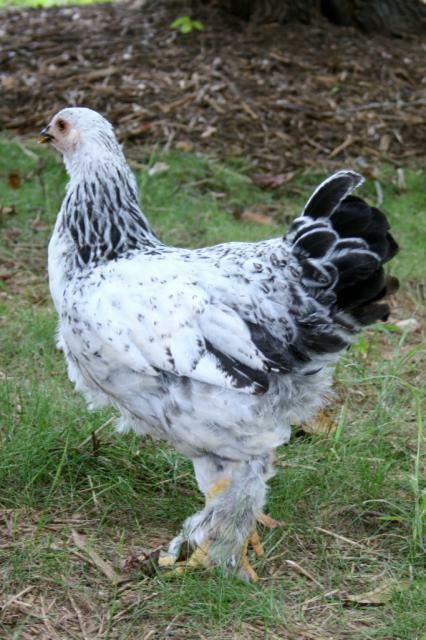 FeatherFoot, the Light Brahma. 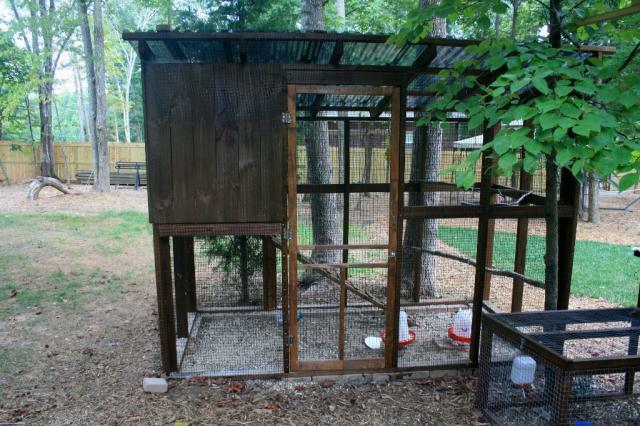 We decided on a more "modern" style coop to blend in with our suburban backyard. It is situated in the coolest part of the yard, snug and shaded between trees. Summer's here are very hot with many days 95-100F, winters hardly go below 30F. 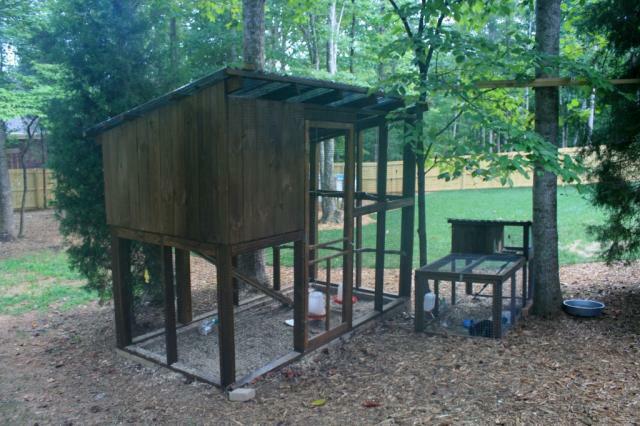 We also built a matching rabbit hutch for "Sniffer" to live next to the coop. The door on the upper box opens and fastens with a chain for cleaning, etc. The run is play sand from the kids sand box. 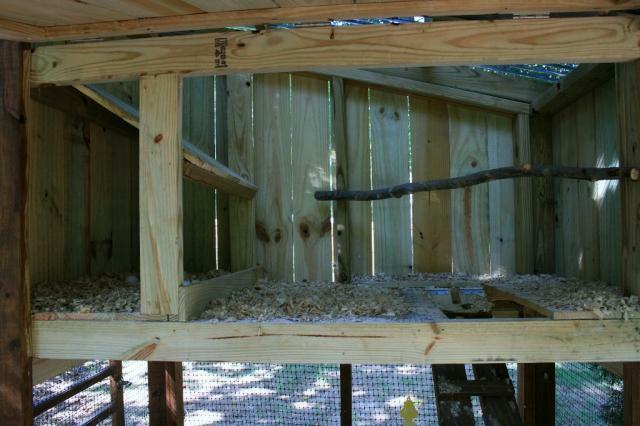 We built a community nest box, and hopefully that suits the hens, if not we can insert some dividers. I've learned much from BYC since planning the coop and would probably do a few things different, but for now, everything is working great! At night the bantams roost on the branch in the coop, while the "big" girls sleep up on top of the hinged coop door, little Chippy makes his way up the ladder too and sleeps in the nest box. I usually let them out to free range in the yard every evening from about 5:30 till they put themselves to bed at 8pm. A few times a week if I have time I'll let them out for a few hours in the morning, too. They love it and are amazing bug hunters! Not any details, plans, dimensions, how to instructions or materials list.